Denne rene, lyse og rolige toværelses lejlighed ligger i hjertet af naturskønne Deep Cove med en fantastisk udsigt over Stillehavet. Med det er nærhed til skove og bjerge, tilbyder det udendørs fritidsaktiviteter entusiaster kano, kajakroning, padle boarding, windsurfing, fiskeri, mountain biking, golf og skiløb. Dette er en 1000 suite med egen indgang, helt selvstændig, fuldt udstyret køkken og in-suite vaskemaskine og tørretumbler. Det kan rumme 4 til 6 personer, er familievenlig (med børn), velegnet til par og bryllupsrejse, Brudesuite, forretningsrejsende, vennegruppe, familiesammenføring, gradueringsfester, renovering, kunstnere og forfattere. Smukke golfbaner rundt inden for 20 minutter-Seymour Golf og Country Club, North Lands golfbane og Capilano Golf og Country Club. Mt Seymour, Cypress Mountain og Grouse Mountain Kun 40 minutter til skiløb. 5 minutters gang til landsbyen, busstationen, bekvem butik, apotek, restaurant, café, park, strand og kulturcenter, som har en 130-pladsers airconditioneret teater. Bibliotek kun 3 minutters kørsel. Du vil elske mit sted på grund af stemningen; ikke kun den betagende udsigt, men også den komfortable seng (Sealy madras), 1 king size seng, 1 queen size seng. 1 Queen size luftmadras. Canadian Hutterite hvide gåsedynduer (hele sæsonen vægt-700 + fylde strømmen) & Regelmæssig Vægt). Kun King og Queen størrelse med luksuriøst sengetøj. High-end apparater - JennAir downdraft sortiment, LG fransk dørkøleskab, Panasonic cyclonic bølge inverter teknologi cirkulerer mikrobølgeovn, Bosch opvaskemaskine, Delonghi bønne til kop kaffemaskine. Sony TV, Gratis højhastigheds Wi-Fi, HBO & Netflix. Valor pejs, Duravit dobbelt ende stort badekar og vask, toilet sæde opvarmet. Mit hus er beliggende i bunden af ​​Mount Seymour i North ShoreMountains, og ligger ganske højt op. Der er en hel del trapper for at få adgang til suiten. Så hvis du overhovedet tøver med at tackle op-og nedture i bjerghuset, er mit måske ikke det bedste valg til dit ophold. Tak for rygning, kæledyr, fester eller begivenheder. Jeg vil værdsætte ikke at forstyrre naboerne. Tak for din interesse og have en smuk ferie i Vancouver! vaskemaskine og tørretumbler, dobbelt ende badekar, toilet sæde opvarmet, tårn levere. Evelyn was a fantastic host. She provided an amazing quantity of goodies for us when we arrived and nothing was too much trouble for her. The house was clean, views amazing and owner great also! Only wish we could have stayed longer!! Would definitely rent this house again!!! Very tidy and lovely house equipped with everything you need. Cozy sitting area with the fireplace and a splendid view. Evelyn is incredible. She was very accommodating and very quick to respond with any questions. She was also flexible with check-in and check-out time, which was extremely helpful. Loved the layout of the space, loved the amenities and the view was amazing. My family and I went to this beautiful house for the weekend and loved where the house was located. The owner met us right away and was super welcoming and informative on how to use the amenities in the house. She was very reachable and gave suggestions on things to do in the area. Very close to Capilano suspension bridge, restaurants, and shopping. I would definitely recommend staying at this house for your next trip to Canada. Dear Melissa :) Thank you so very much for your kind review and ratings !!! Evelyn Wong, our wonderful hostess, has thought of everything you might need-maps, snacks, beverages, extra pillows/blankets, gas fireplace, right down to nail clippers! She is without question one of the most genuine and warm folks I have ever met, with attention to every detail and always a beautiful smile to greet us. The kitchen is state of the art, and we cooked delicious meals there. The sunshine through the wall of windows in the morning is truly liberating. Parking is convenient right in front of the house and yes there are several stairs, but definitely worth the climb for the spectacular view of Deep Cove. Downtown Vancouver is a short drive as are most attractions; we were lucky enough to have a clear night to witness the lunar eclipse from the balcony over the water-what can I say? We explored Whistler/rode the peak to peak gondola, Shannon Falls, Brackendale (bald eagles), Vancouver Island/Cathedral park/Victoria, town of Mission on the way to Hot Springs, Capilano suspension bridge, Lighthouse Park/Beach House restaurant and the list goes on-most of this thanks to Evelyn's extensive map collection and tour book! 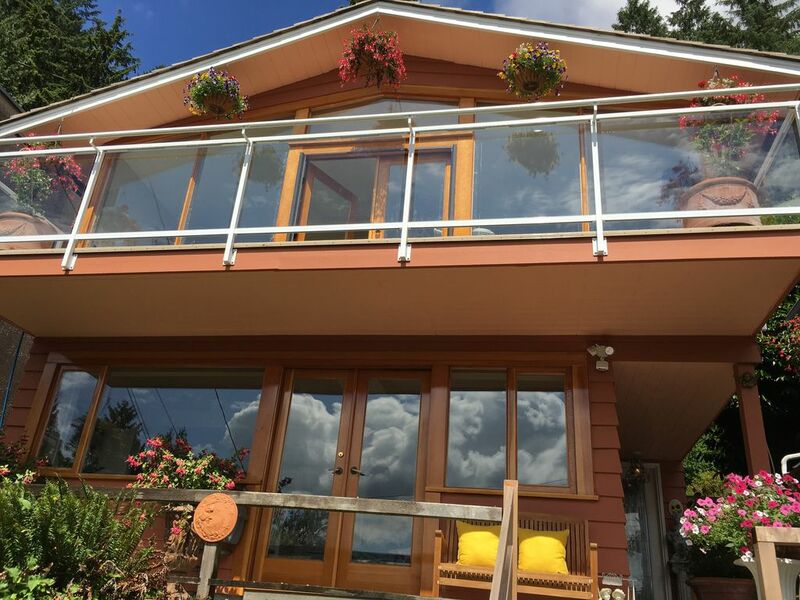 Great food, incredible landscape and friendly people-you will enjoy your stay in Deep Cove! Thank you Evelyn for a vacation we will never forget!! I am so happy you enjoy my place and have an unforgettable memories. Evelyn was such a welcoming host. The apartment was comfortable and cosy, and worked well for our family of 6. Every possible traveller’s need was provided for - toiletries, laundry detergent, board games, coffee machine, welcome snacks and drinks, etc. The views from the apartment were stunning, Deep Cove town was charming. We loved our brief stay, and will definitely be back! Dear Tamara :) Thank you SO very much for your review and rating !!! How wonderful to have met you and your family ! no smoking, parties or events.no pats.